German seven-piece NACHTGESCHREI hereby release third album with their mix of mediaeval rock/metal/folk. Since 2008 the Frankfurt band has made three albums and played festivals like Paganfest and Ragnarock, sharing the stage with bands like KORPIKLAANI and ENSIFERUM. What can possibly be boring about them? This is rock with an odd dimension already in the first track “An Mein Ende”. Hotti has a soft and agreeable voice, a bit of a German Bob Catley, but I detect mostly traditional features in the music itself. What´s good with that is that there are not bits and pieces of black metal, no hysteric drumming or general calamity. German lyrics are not a plus in Sweden, but ethnic parts are mostly a good way. They reach real character in “Herzschlag”, both with a splendid guitar pattern and the use of accordion. They have captured the feeling of past ages, sometimes only vaguely, sometimes spot on as in the title track. I recommend them to keep up the pace to avoid sounding as they do in “Soweit Wie Nötig”. They lose their medieval shape and come across as an ordinary house band in an average restaurant, or as ordinary German rock, to be more polite. Towards the second half they drop the old ages and focus on rock. I definitely miss the opening tracks by that point. It might still be there somewhere but it seems lost among the vocals, guitar and drums. 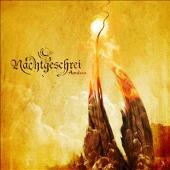 Unfortunately NACHTGESCHREI don´t persist with their splendid concept throughout.